It's Smoothie House's official launch at Westgate and they're having an opening promotion of Buy 1 Free 1! 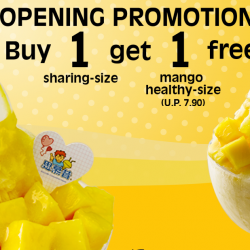 Enjoy a FREE healthy size Mango Snowflake Ice Dessert (U.P. $7.90) with every purchase of a sharing size snowflake ice. Don't miss out on this! Only from 6 - 8 May 2016.